The extent of Mars' huge dust storm on June 11, 2018, as observed by NASA's Mars Reconnaissance Orbiter. NASA's long-lived Opportunity Mars rover is weathering a monster dust storm that has plunged its environs into permanent darkness. That darkness has prevented the solar-powered Opportunity from charging its batteries sufficiently, and the rover has fallen silent as a result. 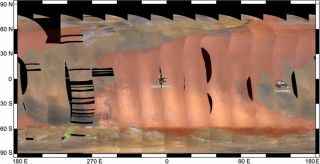 Still, mission team members expressed optimism that the plucky robot, which has been exploring the Red Planet for more than 14 years, will pull through. The golf-cart-size Opportunity landed in January 2004, a few weeks after its twin, Spirit, touched down on a different part of the Red Planet. Both rovers embarked on 90-day missions to search for signs of past water activity. Spirit and Opportunity found lots of such evidence, and they kept roving long after their warranties expired. Spirit wasn't declared dead until 2011, and Opportunity is still going strong; since August 2011, it has been exploring the rim of the 14-mile-wide (22 kilometers) Endeavour Crater. Opportunity has seen a lot in its time on Mars — including another powerful dust storm, which the rover weathered in 2007. During that storm, Opportunity went silent for a four-day stretch, Callas said. But the mission team always had control of the rover, he added; the silence was a choice, an attempt to conserve power during the days of darkness. The current dust storm and Opportunity's present situation are different. This GIF shows the expansion of Mars' huge dust storm of May-June 2018, as observed by NASA's Mars Reconnaissance Orbiter. And the dust is incredibly thick over Endeavour Crater — thicker than anything Opportunity has dealt with before, mission team members said. Opportunity is now enduring complete darkness 24 hours a day, and its power levels have dropped precipitously as a result — from 645 watt-hours on June 2 to about 22 watt-hours on Sunday (June 10), Callas said. That latter number is so low that Opportunity has apparently put itself into "low power fault mode," turning off everything but its internal clock in an effort to conserve energy, he added. The rover will wake up again once it gets enough sunlight to charge its batteries, at which point it will automatically try to phone home. "So, at this point, we're in a waiting mode," Callas said. "We're listening every day for possible signals from the rover, and we'll be prepared to respond to that." You can get updates about the dust storm, and Opportunity's status, at NASA's Mars Storm Watch page. There is ample reason to believe Opportunity will indeed wake up, NASA officials said. It's getting closer to summer in the rover's neck of the Martian woods, which means temperatures are rising. That's good news, because the chief threat to the rover in its current situation is death by freezing — the fate that befell Spirit after it got bogged down in thick sand during the Martian winter and couldn't reorient itself to catch enough sun. And Opportunity won't be able to fire up its main onboard heater until it can recharge its batteries. But calculations by the rover team suggest that Opportunity won't experience temperatures colder than minus 33 degrees Fahrenheit (minus 36 degrees Celsius) for the foreseeable future, Callas said. That's survivable for the rover, which was designed to tolerate temperatures as low as minus 67 degrees F (minus 55 degrees C). "So, we think we can ride this out for a while," Callas said. Somewhat paradoxically, the dust actually mitigates the freezing threat, he added: The stuff traps heat, keeping Opportunity a bit warmer at night than it would be otherwise. It's unclear how much longer the dust storm will continue. Indeed, researchers don't know much about these dramatic events — why they occur during some Martian years and not others, and what drives some to encircle the planet and others to peter out early. NASA is using its stable of active Mars spacecraft — including Curiosity, MRO and the orbiters Mars Odyssey and MAVEN (Mars Atmosphere and Volatile Evolution) — to address such basic questions. Opportunity's handlers will be sweating out the rover's slumber, no matter how long it lasts. "The team has a very strong bond with the rover; you know, we have a very tight emotional connection with it," Callas said. "It's like you have a loved one in a coma in the hospital," he added. "The doctors are telling you that, 'OK, you've just got to give it time, and she'll wake up.' And all the vital signs are good, so it's just waiting it out. But if it's your 97-year-old grandmother, you're going to be very concerned. And so, we are."